Kawaii and huteki merge to make another classic! Saria, The Little Witch That Could. Developer(s) and Others: WAS, Toyo Recording Co.
Other Info: While I didn't find out anything useful concerning WAS, I found out that a CD Single was made for Twinkle Tale. Oh look! What do we have here? Is it...ANOTHER Genesis shooter? Well, more or less...While primarily a shooter at heart, the game has a little more control in the navigation department, giving you the option to trek on foot taking different pathes, explore different rooms and evade numerous traps. In that sense, the game is more of a run-and-gun action game in the vein of Capcom's popular action game, Mercs. What's the deal with this game? Is it worth playing? 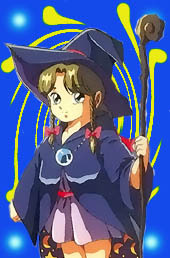 The game has you playing as a majestic young witch named Saria (move over Cotton, you have, or rather "had" some competition) who must fight hordes of evil demons both ordinary and extraordinary with nothing but her magical staff and the clothes on her back. Along the way, she'll meet people who will try their best to aid this intrepid heroine in her quest to restore order to the world and gather the sacred gems needed to do so, which are scattered across the land. There isn't really much to say about the story, so let's just get to the other aspects of this game. If you can't tell by the screenshots below, the graphics are gorgeous, some of the best of any Genesis/Mega Drive action game. The game is extremely fluid, the animation is good, the environments are detailed, and the characters and foes fit the theme of this game perfectly. There IS slowdown, but it doesn't detract too much from the experience and the number of enemies that can be on screen battling at once is pretty impressive. There are more upsides to this game besides simple graphical eye-candy. The game has excellent audio to compliment the excellent visuals, and overall, the game is well balanced with an excellent graphical presentation and solid musical accompaniment. Just because the game has a female heroine doesn't mean it's for softies. This game is action-packed, with traps and ambushes galore, not to mention you have three weapons and two bombs in which to decimate your enemies with. You have your typical spread shot, a straight piercing shot, and a homing shot, which all have their uses, and the havoc bombs cause in this game is oh-so-pretty. The best part about the weapons in this game is how they are powered up. You can power-up whatever weapon you're using, but if you are already at max power with a weapon when you pick up a weapon-upgrade, it distributes the power to a weapon you aren't using, so as not to waste it. Twinkle Tale even has a level where Saria takes to the sky and blasts enemies in a vertical shooter fashion, so fans of shmups should have at it. This game has three difficulty levels to further challenge yourself and though the game is short, you'll keep coming back for a challenge and immerse yourself in the beautiful visuals and enchanting sounds. 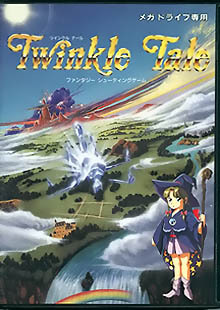 Twinkle Tale is one of the best action OR shooting games you could hope to find on the Megadrive (and the game has no region detection, so you can play it on a Genesis too). With a cute and daring heroine, nearly more action than you can shake a stick at, moderate length, great visuals and a great soundtrack, one of the only things that could have made this game better was a multi-player feature. The only other problem is that most will only know of this one through emulation, as the game is almost prohibitively rare and can reach up to $100. Is it worth it? Well, that's not for me to decide, but you should find a way to play it, however you can. This review has 81 extra images. See credits for Twinkle Tale.